SOUTH Pacific Brewery will continue its partnership with rugby league over the next two years with a K1. 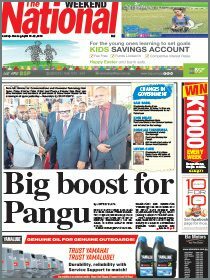 2 million committment to the Papua New Guinea National Rugby League Competition. SP Brewery managing director Stan Joyce signed the two-year platinum sponsorship agreement with PNGNRLC board chairman Adrian Chow and general manager Stanley Hondina and also presented a cheque for K620,000 to support the semi-professional competition which will expand from 10 to 12 teams in the new season. Joyce said SP had increased its support from K400,000 in 2017 and this year to K620,000 next year and in 2020. Joyce said rugby league had a significant impact on the PNG community and culture and provided avenues for community participation starting from amateur through to elite level for both men and women in the country. 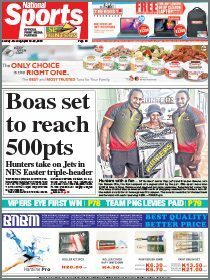 “We come on board once again to support PNGNRLC under our SP Lager brand to partner with the country’s number one game rugby league through the Digicel Cup,” Joyce said. Joyce said that the PNGNRLC was a platform that brought the country together through fans at games and in front of TV screens around the country. PNGNRLC board chairman Chow said the support from SP would be used to cover administrative and logistic costs in the new season. “This means that we pay for the airfares, accommodations, transportation, allowances and such for the franchises next year,” Chow said. Chow said the support from the brewer showed that it was committed to the sport and that it was also now one of the best managed codes in the country. “This is a huge support and it shows SP’s willingness to continue its partnership and it has seen the growth of rugby league at this level. Chow thanked SP for being a long time sponsor of the sport. PNGNRLC general manager Hondina said the new season would bring new challenges as the competition would have two more teams . Hondina confirmed that four franchises (including three new bidders) had paid the K100,000 registration. He said successful new bidders would be announced at the end of the month. So far the new bidders for the 2019 season are the Central Dabari, Kimbe Cutters and the Hagen Eagles. The Southern Blacks (Moresby South) decided not to bid this year while Bougainville has expressed interest in the following season.